Telling ghost stories is a favorite pastime of Mai Taniyama and her high school friends. Then she meets 17-year-old Kazuya Shibuya, a real ghost hunter, and learns that things literally do go bump in the night! Shibuya (nicknamed “Naru” by Mai) comes across as being rude and cold at first. But Naru is actually quite caring, and Mai has a crush on him. So after their first meeting didn’t go so well, she is thrilled when he calls her up and offers her a part-time job. Naru is the gifted leader of Shibuya Psychic Research, which investigates and solves mysterious hauntings. He detects paranormal activity using high tech equipment with the help of an assistant, Lin, who is the strong silent type. They also utilize the services of a famous television medium as well as practitioners of different faiths including a Buddhist monk, a Shinto shrine maiden, and a Catholic priest. Initially a lowly assistant, Mai soon finds that she’s not as useless to the team as she thought. Ghost Hunt delves into Japanese mythology, religion, and culture while focusing on a variety of supernatural or psychic phenomena. The series includes captions for the benefit of non-Japanese viewers explaining historical references and definitions of terms. The team never knows what they’re going to be facing next as they encounter poltergeists, vengeful spirits, a psychokinetic girl, will-o’-the-wisps, the ghost of an autistic boy, a monster, and even zombies. Combining state-of-the-art technology with age-old spiritual techniques, the characters confront and vanquish evil time and time again. The most refreshing surprise of all in Ghost Hunt is that the Bible is quoted in almost every episode! 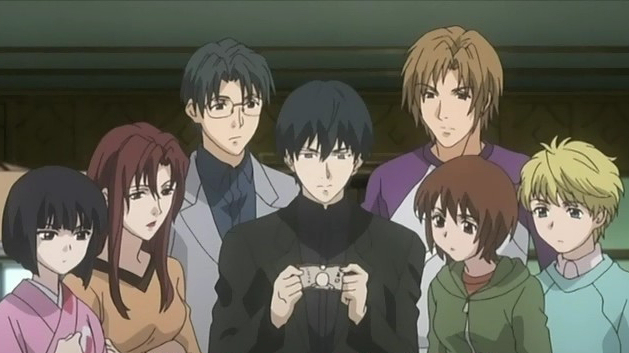 Although Christianity is only one of three religions featured in the series, this anime is in effect introducing the gospel message to Japanese kids and others around the world – and the Bible says that God’s word will not return void. John Brown, the young priest from Australia, recites The Lord’s Prayer and he exorcises spirits by splashing holy water while reading the first passage of the Gospel of John. Ghost Hunt isn’t extremely scary, but it’s scary enough. Most episodes have their share of intense chill-inducing moments, although they’re over quickly. Nevertheless, the creatively animated visuals of ghosts are very spooky and may come back to haunt you if you’re home alone late at night. Likewise, the excellent soundtrack conjures up some truly eerie and tense musical arrangements that help build suspense and set the mood. This anime is best for teens and adults ages 13 and up. Several cases involve the deaths of children, and one of those episodes (“Silent Christmas”) is not so much frightening as it is sad and tragic. Ghost Hunt is more like a suspenseful detective series than a creepy horror anime, except for perhaps the nightmarish “Bloodstained Labyrinth” episode. The series has many funny moments too, and entertaining interplay between the characters. Ghost Hunt has 25 episodes of 25 minutes each, and most of the story arcs last for 3 or 4 episodes, except for a couple of them which are shorter. The conclusion wasn’t quite as satisfying as it might have been had a few more questions been answered and if the relationships had progressed further. Nevertheless, the anime does end on a good note even if you have to leave the rest to your imagination. Amazon.com has a great deal on Ghost Hunt: The Complete Series !